From drone warfare in the Middle East to digitalspying byÂ the NSA, the US government has harnessed the power of cutting-edge technology toterrible effect. But what happens when ordinary people have the same tools attheir fingertips?Benjamin Wittes and Gabriella Blum reveal that thisnew world is nearly upon us. Soon, our neighbors will be building armed dronescapable of firing a million rounds a minute and cooking powerful viruses basedon recipes found online. These new technologies will threaten not only ourlives but the very foundation of the modern nation-state. Wittes and Blumcounterintuitively argue that only by increasing surveillance and securityefforts will national governments be able to protect their citizens. The Future of Violence is at once anaccount of these terrifying new threats and an authoritative blueprint for howwe must adapt to survive. Citing Hobbes Locke, and Weber, the authors offer an impressive analysis of how the state will need to change to counter these threats. Publishers are competing to put out increasingly dire warnings about the fast-changing threats from cyber attacks, but The Future of Violence is original and insightful in turning to political theory for answers. A lively and often terrifying exploration of the dark side of our technological age. A careful, sophisticated analysisIn discussing how to combat [cybercrimes], the authors transcend cliches about tradeoffs between liberty and security, patiently explaining how without security, there is rarely much liberty. An alarming and informative new book.... The Future of Violence is a frightening book, but it's not an exercise in fear-mongering. Rather than arousing fear in order to advocate some dogmatic ideological agenda, Wittes and Blum offer a good example of a productive response to the world's multiplying horrors: thoughtful and realistic analysis of potential solutions. " "A book that manages to meld Hobbes, James Bond, science fiction, and Supreme Court decisions is a rare read. All the more impressive when it takes a complex set of urgent questions about the intersection of technology, security, and liberty, and offers insights and at least the beginnings of answers. Violence will be always with us, but its forms are changing in ways that challenge our ability to respond to and regulate it." "Benjamin Wittes and Gabriella Blum have written a compelling and provocative book about an important topic we have not adequately faced: managing catastrophic risk in a technologically advanced society. I strongly recommend this book even for people who will not agree with the authors' conclusions." "I'm getting my information from one book. It's called The Future of Violence. 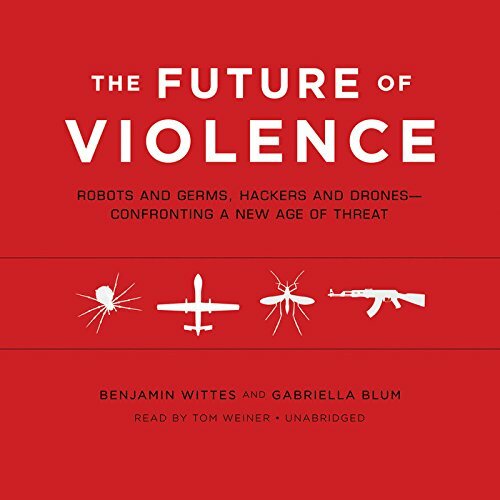 It's by Wittes and Blum...It's about the new kinds of terror married to technology. Every single person in America should read this book. The first chapter will change the way you think about the future. It will scare the living wits out of you." "The Future of Violence is as fascinating as it is accessible. A fascinating political science treatise on the future of technology, security and government." "What the authors achieve in this work is to raise the profile of issues at the intersection of biology, technology, and government policy...Recommended to readers of governmental policy and the ethics of technology, who will be especially interested in this timely work." "[An] ambitious...treatise regarding a particular terror of modern life: the increasing ubiquity of potential harm spawned by technological transformations.... The authors raise fascinating questions.... A thoughtful...Cassandra warning of great vulnerabilities disguised as gifts." "Citing Hobbes Locke, and Weber, the authors offer an impressive analysis of how the state will need to change to counter these threats. Publishers are competing to put out increasingly dire warnings about the fast-changing threats from cyber attacks, but The Future of Violence is original and insightful in turning to political theory for answers." "A lively and often terrifying exploration of the dark side of our technological age." "A careful, sophisticated analysis...In discussing how to combat [cybercrimes], the authors transcend cliches about tradeoffs between liberty and security, patiently explaining how without security, there is rarely much liberty." "An alarming and informative new book.... The Future of Violence is a frightening book, but it's not an exercise in fear-mongering. Rather than arousing fear in order to advocate some dogmatic ideological agenda, Wittes and Blum offer a good example of a productive response to the world's multiplying horrors: thoughtful and realistic analysis of potential solutions."